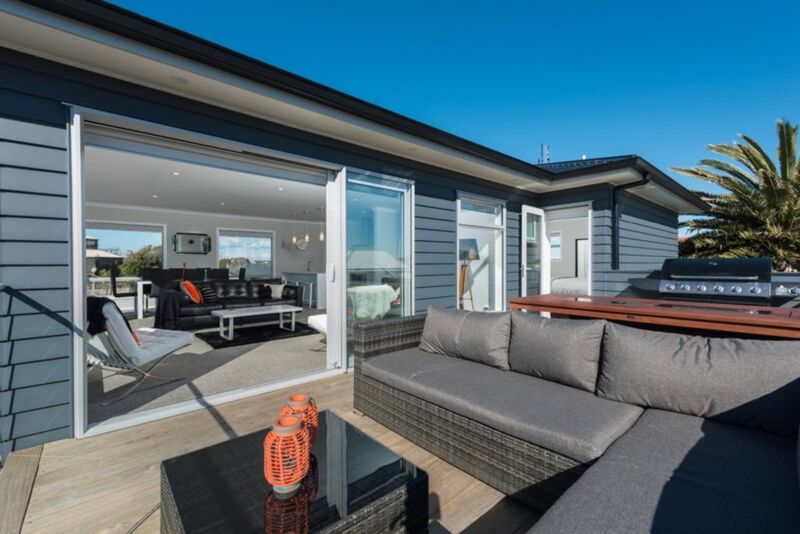 Located just across the road from the stunning Papamoa beach, The Whitesands beach house is sure to impress. All the details have been considered in this home for your enjoyment whilst you are on holiday. Through from the top quality comfortable beds, stylish furnishings and the state of the art sound system and T.V. The open plan Living area upstairs flows onto a large furnished deck where you can take in the stunning views over the ocean and beyond to Mayor island. The spacious en-suited master bedroom upstairs off the lounge also opens onto the deck. The modern kitchen has a butlers pantry for that extra space. Downstairs has another lounge with an additional T.V for the kids to have their own chill out area where a sofa bed can sleep 2 extra guests. For entertainment , enjoy table tennis and darts in the large double garage. We had a lovely weekend despite the weather! Great house, perfect for us and the kids, and having some separate space to the grandparents. Lots of things to do even though it was raining, well equipped kitchen, table tennis challenges and we still walked along the beach just over the road. We will be back and hopefully bring the sunshine with us next time! Lovely property. Modern and clean and easy to live in. Very open, light and comfortable living areas and kitchen with views to the sea. Bedrooms very comfortable. Great house, tidy, close to beach, close to shops, lots of toys. Highly recommend! !